WordPress themes and plug-ins are quite extensively used by users in creating attractive and responsive user interface designs for websites – be it of any type such as an informative website, eCommerce websites, blog websites and so on. Designers can refer these WordPress themes online which can be downloaded free of cost, and used in the website design. 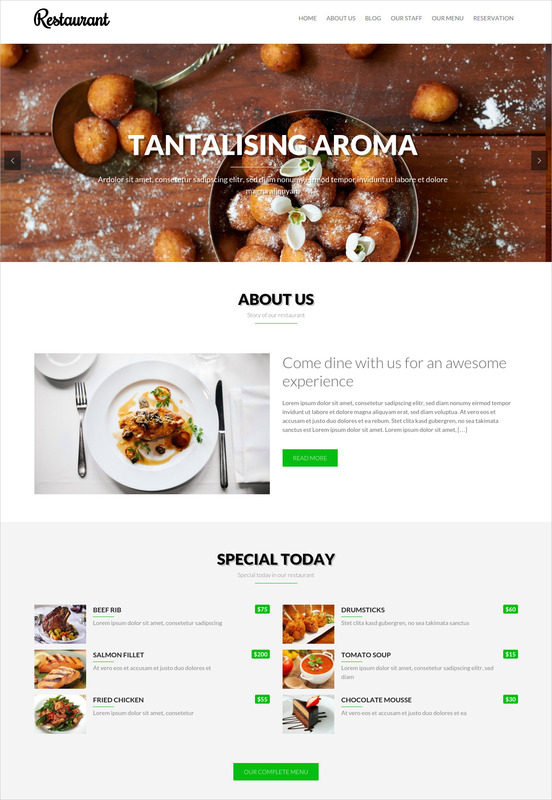 This is a stylish WordPress theme which is an apt fit for anyone who’s looking to design a website for his restaurant, dinner, café or bistro. If you’re a food-person, and own an outlet, then this is one of the best restaurant themes you will find in the market today. It’s got a clean and sleek layout, armed with all of the basic functionality and compatibility options which would give you the freedom to explore and experiment before setting with a finalized version for the website. What’s more is that there is a section which allows to put up ‘Specials’ from your menu and tempt your customers to come and grab a bite! This particular theme is very impressively put together catering to medical and healthcare industry. This theme is the apt choice for any website which is looking for a designer-upgrade. Packaged with all the essentials, this medical WordPress theme not only has a modern and sleek design layout, it has a comprehensive set of different tabs on the main-page itself. 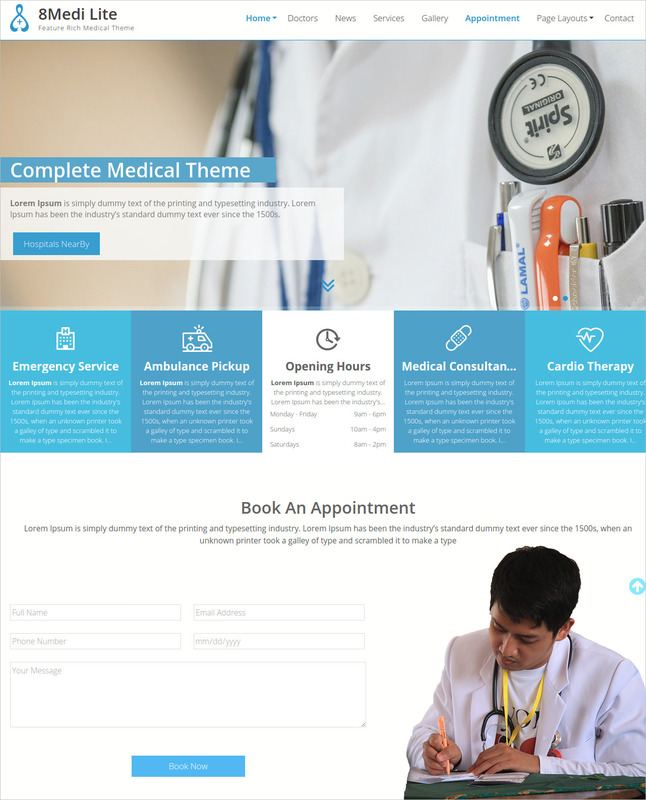 It has a light-blue and white color scheme – which by the way is perfect for a website of a medical facility. Needless to say it has all of the compatibility and functionality options which make the entire design process a whole lot quicker and easier. If you’re a gaming company or just a solo gaming pro that wants to building an interesting and attractive gaming website to share all of the latest info about the industry and business, then this particular theme suits the purpose to the T. Check out the superb urban design and modern layout. The color scheme is not very complicated – black and white – which ensures that the viewer never gets distracted while reading the content. It is SEO-enabled, and has a wide number of built in widgets and short codes. Not to forget, the theme is easy to customize and has high functionality. For all the blogger-community, this minimally styled blog-centric WordPress theme is the perfect solution. It has a straightforward, uncomplicated, creative design, a cover picture which would embed the title and introductory lines of the blog. The theme has an all-white background, meaning the content you write will get noticed and read by all means. The social media widgets are built in, so you can easily provide the URL on Facebook, Twitter and Google Plus. Most importantly the WordPress theme is compatible with all of the big browsers, which means your readership will not be affected. The Parallax WordPress Theme is the latest rage in world of themes these days. 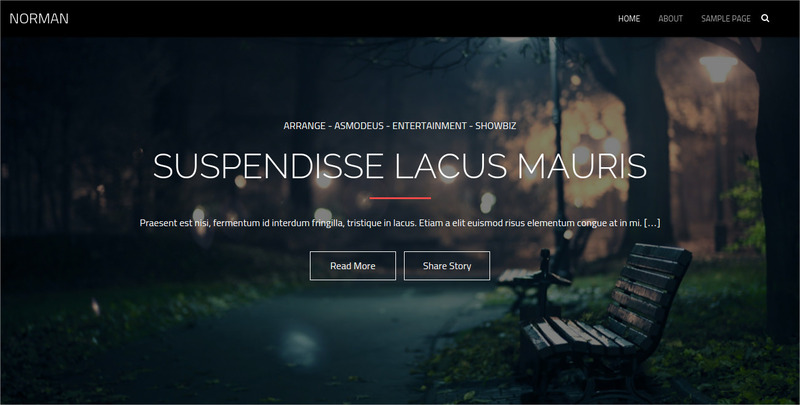 The reason is simple, this kind of WordPress Theme brings together two parallax scrolling and single-page design. With this theme, which is by the way very fitting for business websites, allows you to showcase your products and services on one single page. Now isn’t that cool? 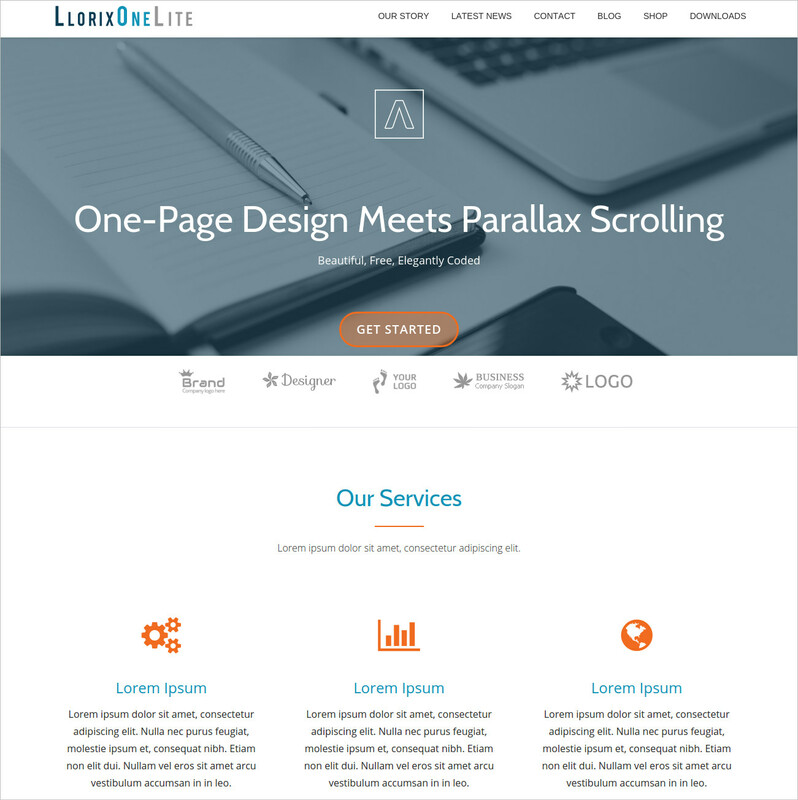 Take a look at this creatively designed Parallax WordPress Theme. Your visitors will mighty enjoy navigation on the website, because Parallax is a different experience altogether. It is built using the latest design code, so speed and efficiency is never going to be an issue of concern! If you’re looking for a truly unique WordPress theme for an Ecommerce venture, then your search ends here. Check out this particular Ecommerce WordPress Theme, replete with the best features and technology to ensure that your website is at par with market trends and standards. You will get sliders here to flaunt your range of products on the main page itself, an instant luring factor for customers. The design and layout is modern and creative. Functionality and compatibility rivals with the best in the markets. This is one theme which can very ably impress your visitors and mean good for your business! 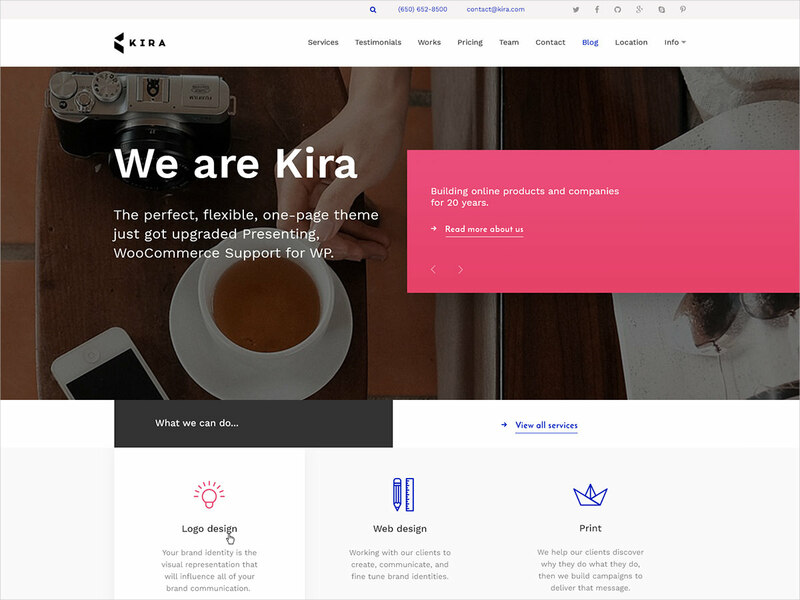 This is a well-designed eCommerce-ready WordPress theme that you can employ for showcasing your personal or company portfolio, exhibiting your products. With this theme you can very well set up an efficient online outlet for your products and services. This theme easy to customize and loaded with goods that make website development an easy undertaking. It has a creative and fully responsive layout design to make sure that your visitors will have excellent viewing and navigation experience whenever they go to your website. The theme offers great modern layout for landing page, full width slider, parallax ready and product catalogue. Let’s introduce you to this is uber lightweight WordPress theme which has all the tech goods packed in it already, so you don’t have to go looking elsewhere? And did we tell you, this one looks very awesome! The features are already there, so is the minimal yet modern layout and design. The extra functionality and compatibility plusses make this theme not to be missed. 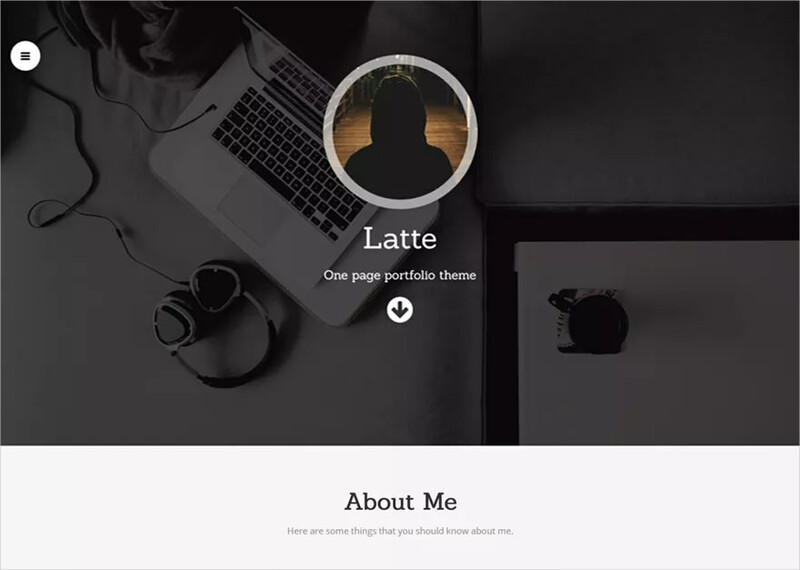 You could use this theme for a website which is commercial or for showcasing a personal portfolio of work to the rest of the world. The easy-to-customize and 100 percent responsiveness only make this theme all the more better. 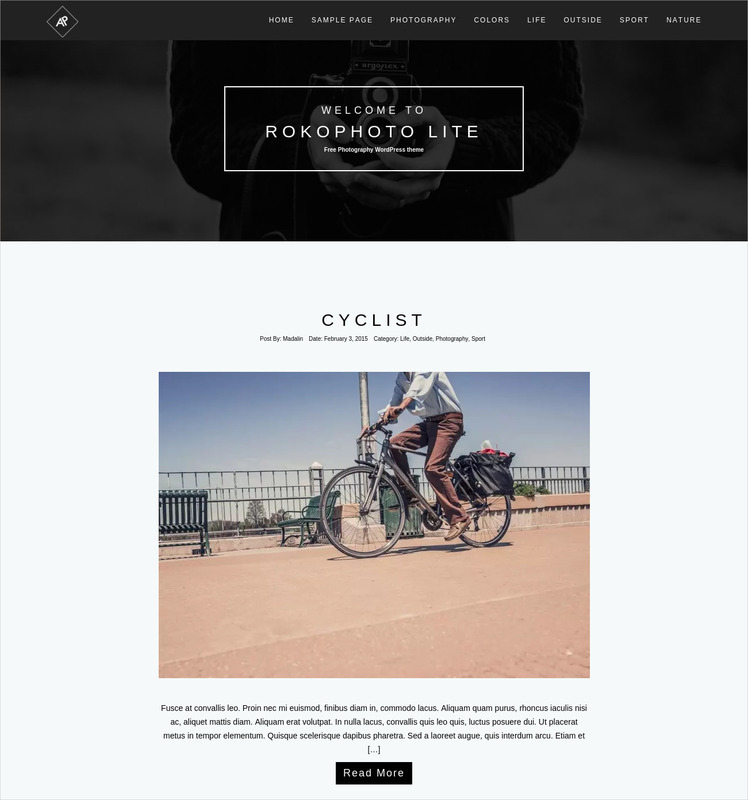 Here’s a stylishly simple Photography WordPress theme which is a delight. The reasons are many – the theme is lightweight yet loaded with functionality and compatibility bests. This means that you and your visitors will get to experience extraordinary efficiency while navigating through the website. The black background and white foreground is a combination, which is an all time favorite and perhaps the best way to showcase your works behind the lens. The theme is completely and easily customizable so you can explore and experiment and explore the suitability of the options and features before taking the final call on how the theme sits with your website. 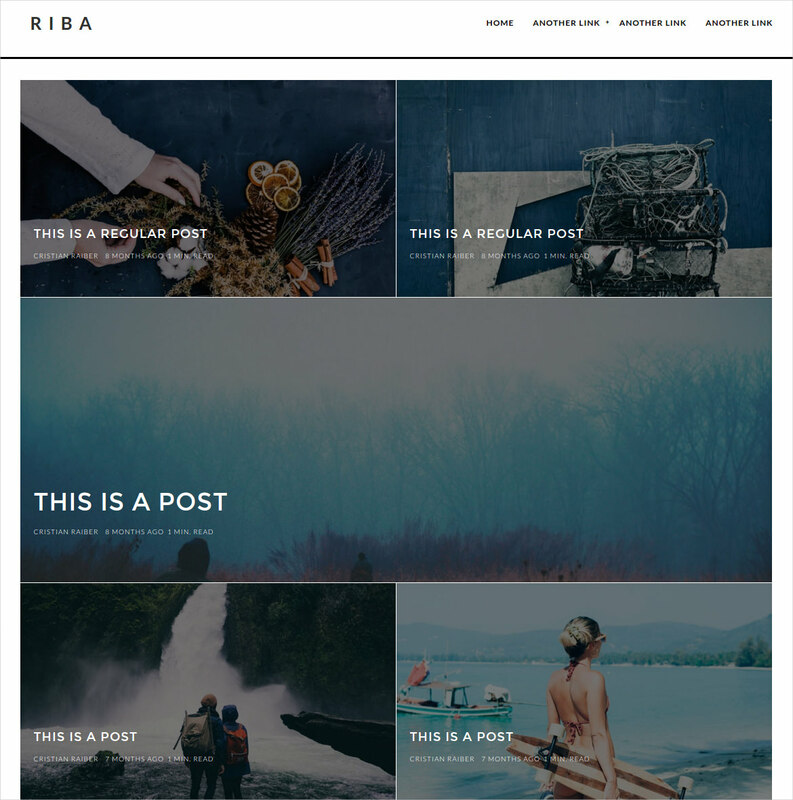 This minimalist designed WordPress theme is an excellent choice to build a blogging or portfolio website. The theme is packed with some excellent features, and you will also find a drag and drop builder to further improve the look and usefulness of the website for your customers. As the design is minimalistic, you can be assured that the focus will never shift away from the content, while the design and modern layout will continue to impress viewers after all. This theme is loaded with great and easy to customize set of elements, so you have total freedom to work with the elements to create a website which looks and behaves just like you want it to. If you’re looking for an amazing business-centric WordPress theme, then is it. This theme has a clean and modern layout. Equipped with Parallax scrolling facilities for the various sections of the website, you can be confident that your website traffic is going to enjoy navigating through the various pages of the website. If your content and services is just as powerful as the design and functionality of the theme, you can be confident that the traffic is going to increase in no time at all, meaning good business for you. The Theme makes any business website look very visually impress and highly functional. Speaking more about the specialty of this theme, the elements are fluid and easy to customize. If you’re in the video gaming line of work, then your online presence ought to be as good as the work you do. Being a designer in any field is a challenging to do, and the expectations are quite high. 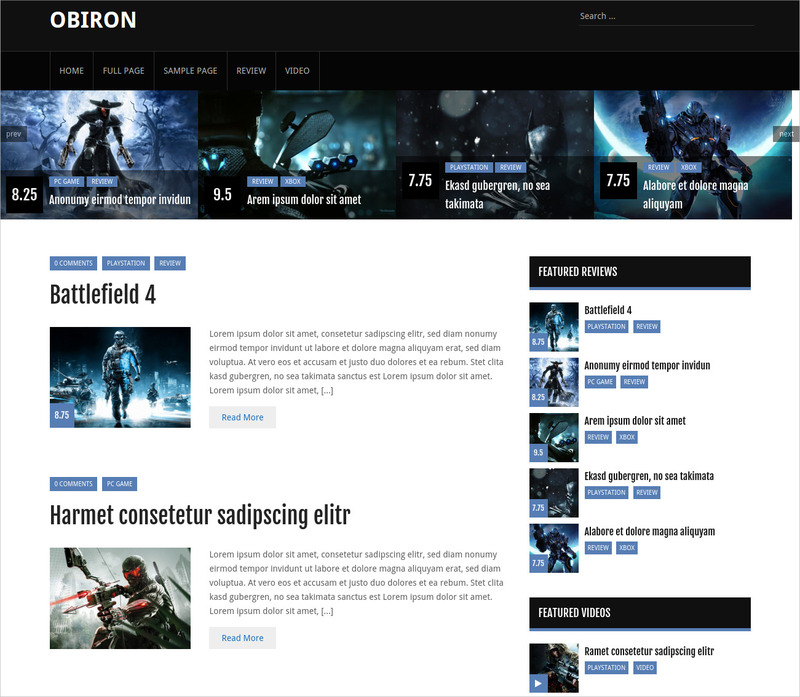 Check out this awesomely designed and fully loaded WordPress theme to use for your video game blog. It’s got an elaborate layout and a comprehensive set of features and facilities. It’s a very aesthetic WordPress theme and only becomes better due to its lineup of easy to customize elements which work together to create the perfect website experience for the end-users. The main page contains many sections, which means you get to see and read a whole lot of stuff on the landing page itself. 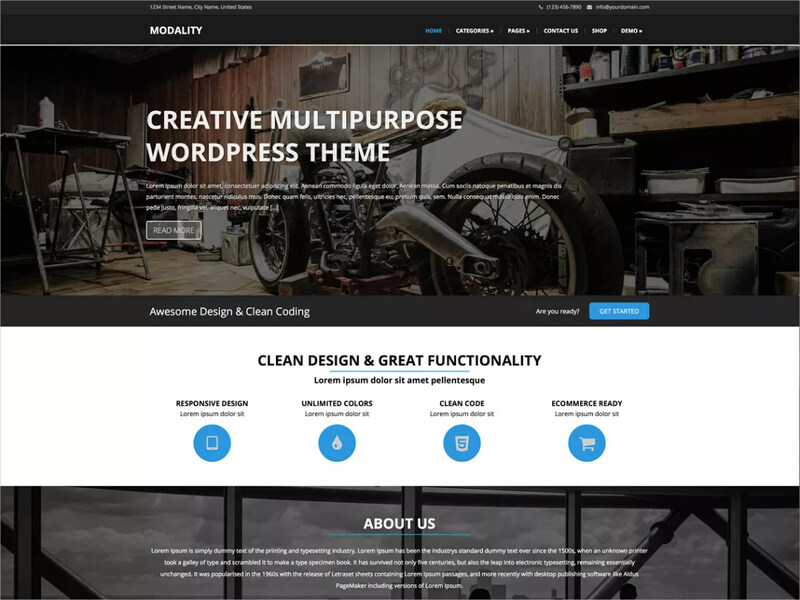 If you’re up and looking for a website theme which offers you good amount of space and functionality options, well then this Multipurpose Responsive WP Theme is no less in what it does as a WordPress theme. It boasts of cross-browser compatibility so your website works equally well on all web platforms without being problematic anywhere. The layout is modern and created to encourage minimum scrolling and maximum work. You can easily resize the elements – fonts, images, texts, graphics etc. This theme uses the Responsive Web Design (RWD) is a web design technology which aims at reducing the scrolling and resizing tasks across different devices. This theme is a perfect fit for anybody who is looking for a website which has a clean and validated code which can be worked by a rookie person with just elementary knowledge of PHP and HTML coding. The theme options panel allows even the most inexperienced people to move around and customize the theme with features and elements of their choice. It’s such a simple do really. Won’t take much of your time. The theme has a localization feature, which means the content can be easily localized using the built-in text without having to touch the source code. If you want to get a church site up and running, yet you don’t know where to start, well, there’s no need to worry. 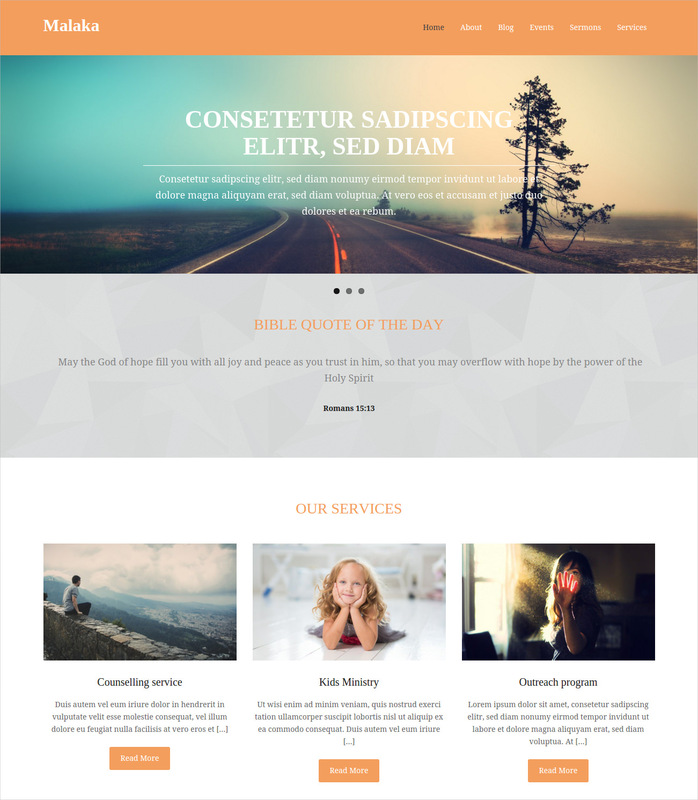 Check out the Malaka WordPress theme which ranked amongst the 10 WordPress themes for Church sites. This one has a Bootstrap framework and is completely customizable to fit to the needs of any church organization or outlet. This theme offers three main custom post types – Services, Events, and Sermons, which are important elements of the website of a Church. Users can just simply select a post type and update the content as they want. There’s also a slider carousel to play images. 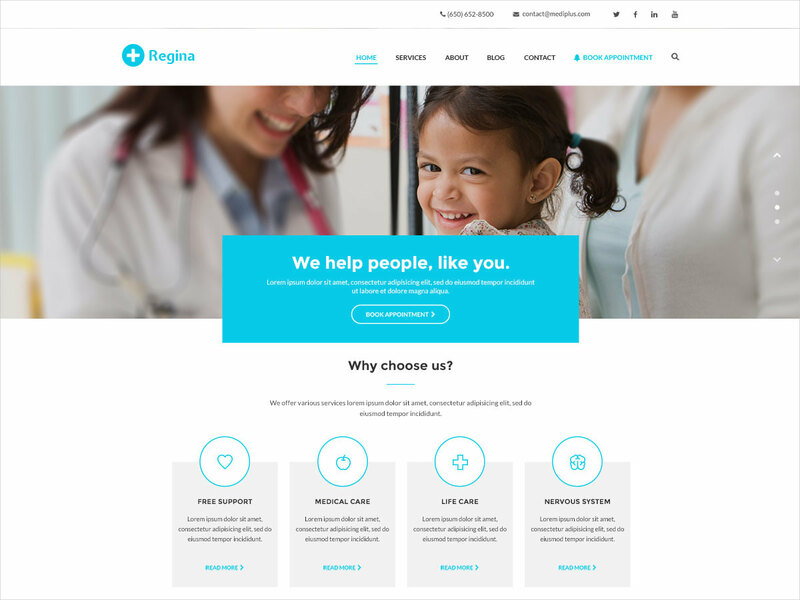 This theme, which is actually called ‘Regina’ is a lightweight, modern, responsive, well-organized theme which is especially apt for medical outlets and organizations. If you run a medical service and need online representation, this particular theme is perfect for the cause. It’s one of the themes which is easily customizable and can be personalized sans any previous experience in web design and development. It also has Translation & WMPL Ready asset, here to help you design a multilingual website. There’s also an Ecommerce support system, so you can use the same theme for an Ecommerce website as well. Pretty cool, eh? 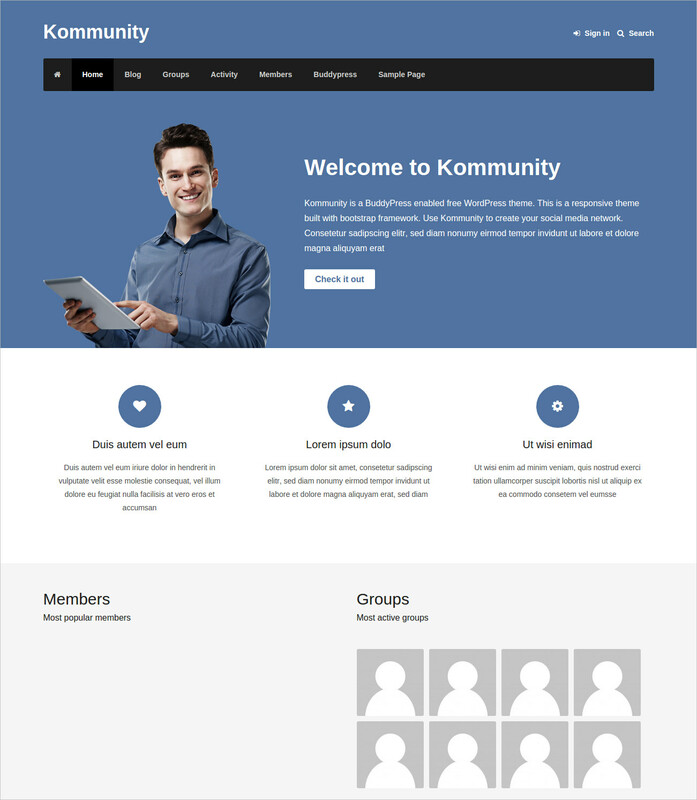 The ‘Kommunity’ theme is a perfect pick if you’re looking to set up a social network platform. The theme shares compatibility with another WordPress social media plug-in called as ‘BuddyPress.’ It’s built on a Bootstrap framework and is 100 percent responsive. What’s more, it comes loaded with all of the prerequisite themes, options, custom homepage, custom page templates, awesome icons, fonts etc. It’s a ready to go theme and it’s easy to customize and install. Not to forget it’s rate compatibility and functionality make it all the more better and preferable. There’s an intro section, banners sections – all easily customizable. This one’s truly an out of the box multipurpose theme which you can use to create a website for a business, magazine, an online outlet, a simple blog… keep your options open, and this theme is ready to accommodate them. It’s retina-ready and 100 percent responsive. You’re going to absolutely love having this theme as the backdrop of your website, because the features are so amazing and they let you accomplish so much while you’re trying to get your website up in the best possible way. Need we add that the theme has a bunch of interesting inbuilt options, fonts, layouts and the works ready for you already? As the name says, this one’s truly well-placed! 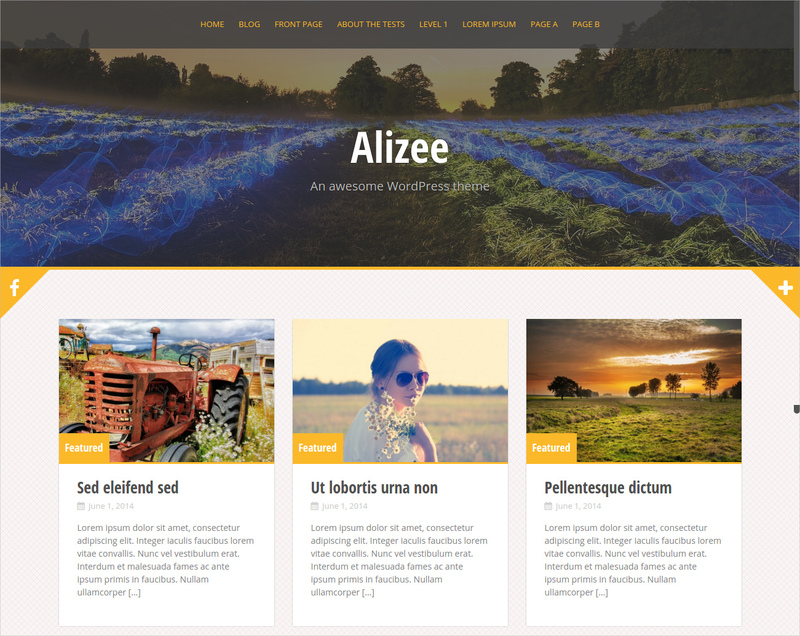 This is a modern and premium WordPress theme which you could up on your website, especially if you work and deal in photographs and pictures. Yes, this one is essentially a Photographer’s delight WordPress theme. This theme is very easy to work with and fully customizable, with an array of features and options aimed at letting you create an excellent website to flaunt your photo-portfolio in the most interesting way possible. Need we add that the theme allows great functionality and also has cross-browser compatibility and flexibility which lets photographers post content in a great way, without sacrificing on the business needs! 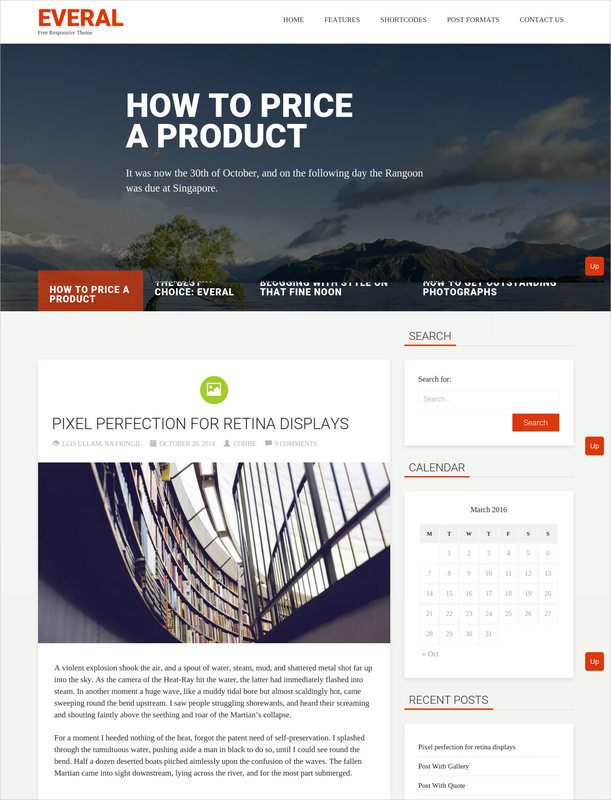 Built on a Bootstrap framework, this theme is just perfect for a magazine portal. It comes equipped with the essentials such as custom homepage, custom widgets, custom menu and theme option page. There are three custom widgets in this theme. As far as the theme customization panel goes, there’s a news ticker section, Features News, Promoted articles, Latest news section, Custom styling is enabled and banner ads customization lets you arrange the banner ads on the sidebar. The layout and design is at par with best in the market – modern and sleek, uncompromising functionality and browser compatibility features sweeten it much more! 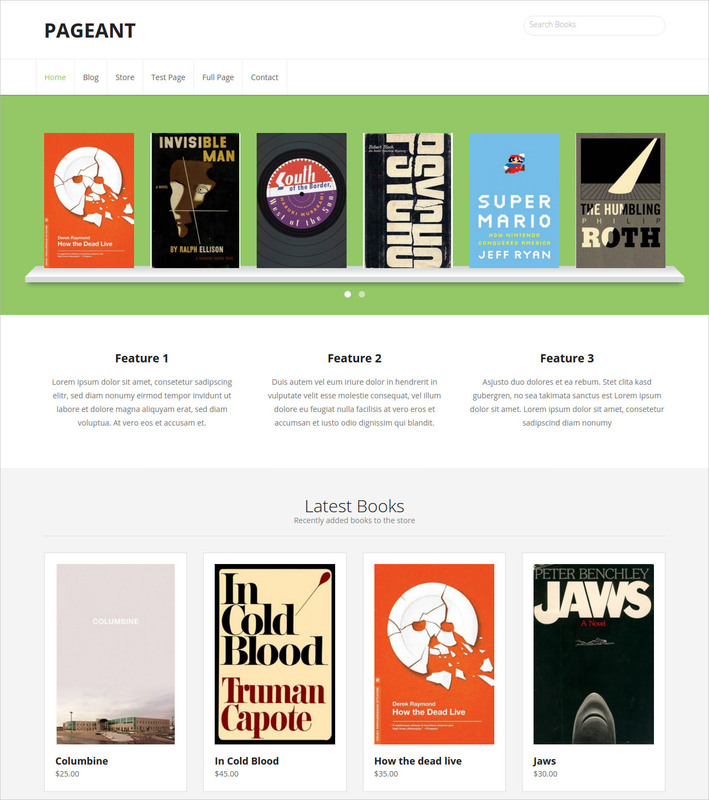 This theme is good for news developers, designers & freelancers, to showcase their portfolio. It comes equipped with an array of options, inclusive of a services section, and so much more. What’s the best part is that the theme is easy to customize. With the help of the WordPress customizer, you can enforce all of the customizations very easily, saving you ample time on doing other important things – such as deciding on what kind of content goes up on the website. Yes, the theme has cross-browser compatibility, high functionality and all of the other works! Developers are going to love this for sure! 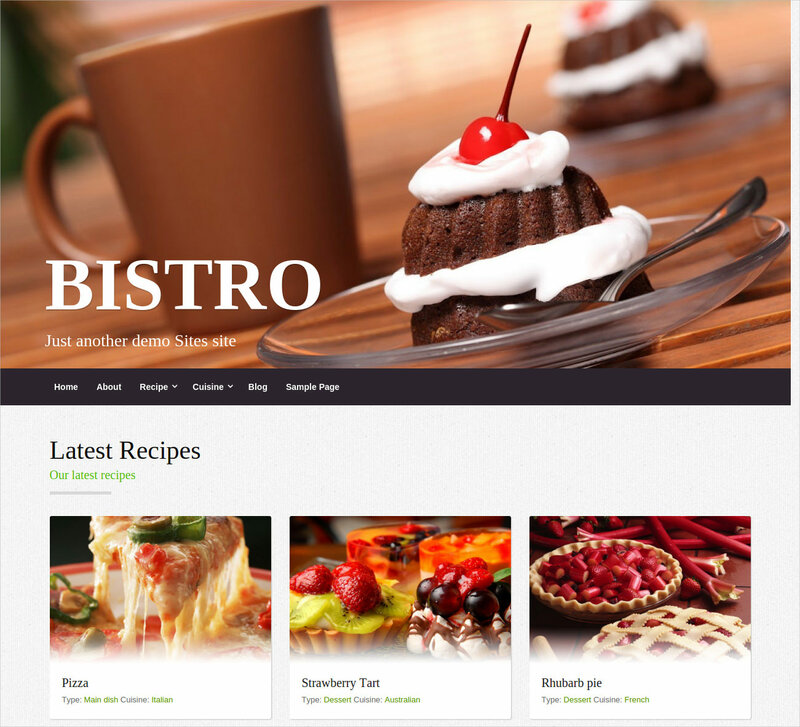 Yum up your website further by using this theme. It’s an ideal fit for any website which works essentially as a recipe showcase. It’s a theme to show off your culinary mastery. It has built in features which let you post recipe content – in text and pictures. You can post cooking videos as well. You can alter the color scheme according to your preference. 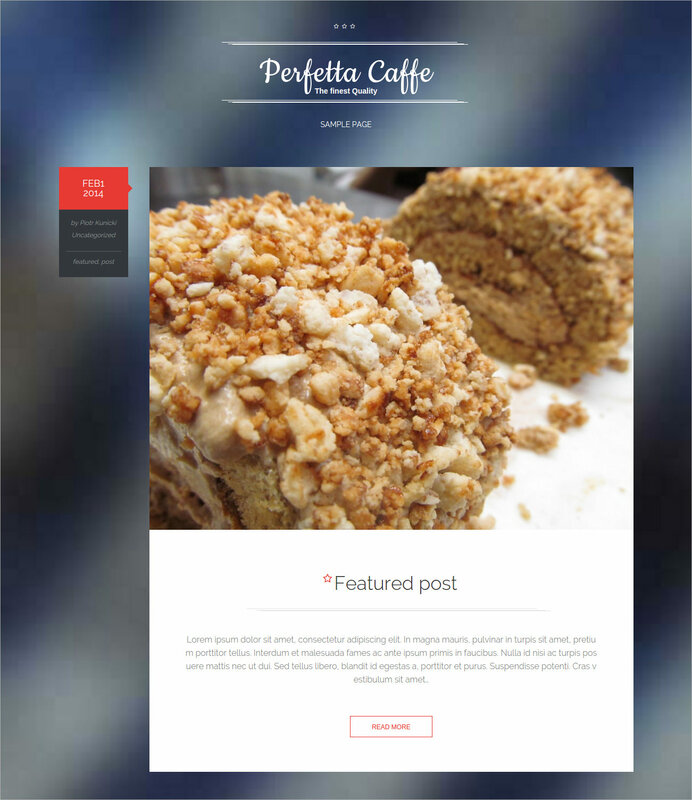 In all respects, this theme is easy to customize and has a set of some of the wonderful tools and widgets with which you can make your website just as delicious as your food is! 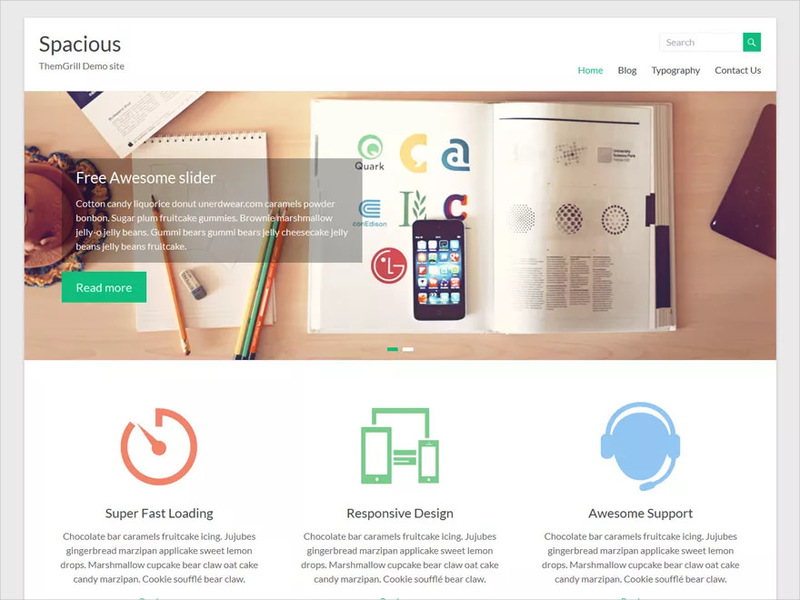 Here’s another great multipurpose WordPress theme. If it’s multipurpose, it means you can use it to create a professional corporate website, or even use it for exhibiting personal works such as a blog or the like. The USP of course lies in the features – such as great functionality and the fact that it works very well on multiple browsers. To top it all, the theme is fully responsive, so your visitors and you can access the site on any device! Did we happen to mention that the overall design and layout is oh-so-modern and high on functionality and compatibility? If you’re looking to design a corporate website but don’t have the right chops for it, well, have no fear. 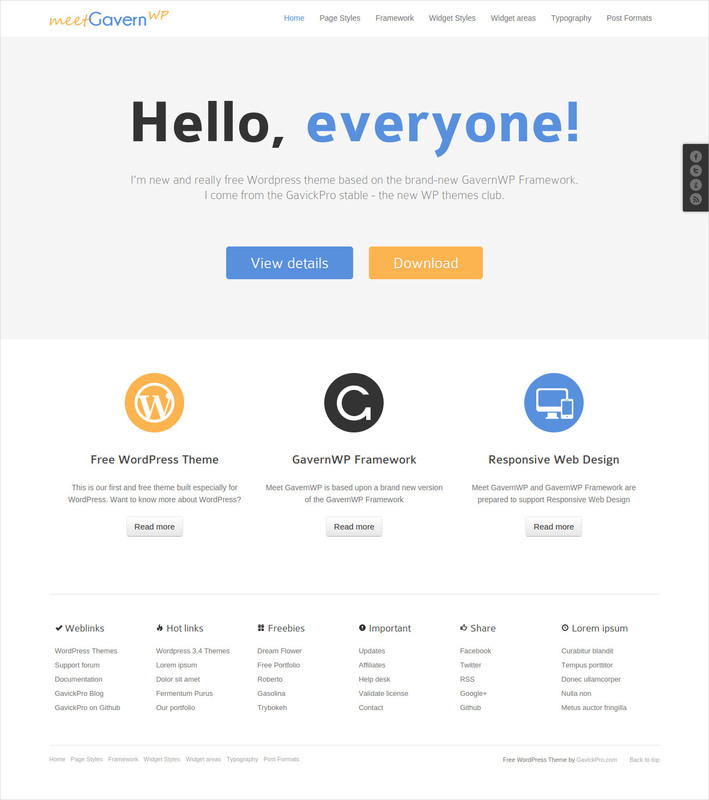 WordPress themes are here. Take one good at this modern and responsive business theme and we know you’re going to be bowled by what it has to offer, and how much less work you have to put in to get it up as the theme of your business website. Let us also tell you this theme is already stacked up with all the necessary tools and tricks which you’d need for sprucing up the website to make up the mark with other big business websites trending on the Internet. Here’s one more impressive avatar of a Multipurpose WP Theme. This one’s called Modality, it boasts of a clean and modern design, making it a perfect fit for any type of website. There’s a whole big variety of options to customize the look and feel of the theme, and it can be easily done through the WP Customizer. The theme has 100 percent responsive design, customizable home page sections, supportive Google fonts, unlimited colors, animation, automatic image resizing and lots more. Retina Ready icons are delivered by the FontAwesome icon pack. By the way, the look great on HD devices! For those who need to spice up their eCommerce website, then this WordPress theme is the answer. It has all the important and necessary website works and tools stacked up inside, all you have to do is select and work around with the options available. The theme is heavy on the options framework, is aligned with WooCommerce. The options page makes it easy for you to customize the theme and its features the way you wish to. What’s more, the theme supports cross-browser compatibility and is equipped with a specialized high functionality feature too. Moreover, the theme is 100 percent responsive. 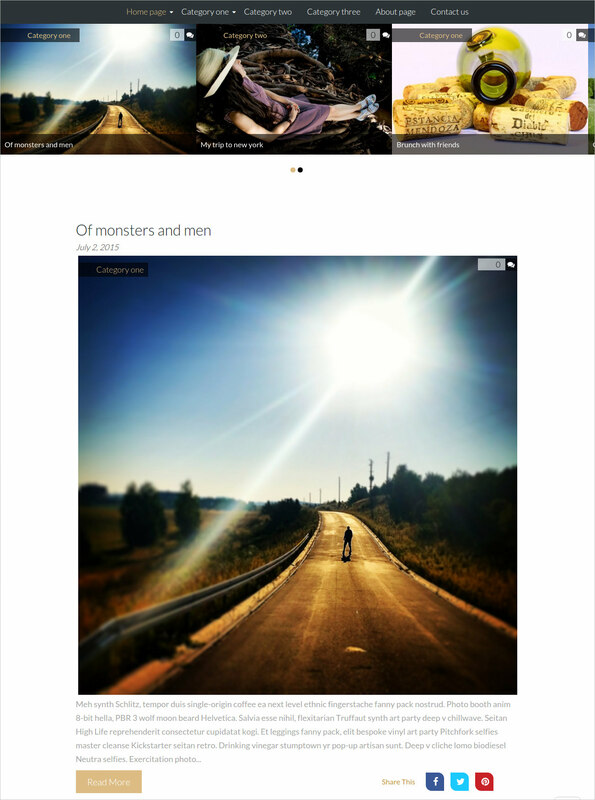 This is yet another Parallax design theme which is 100 percent responsive and looks great. The social menu and sidebars on the homepage in this theme are toggable. It is a Pinterest inspired theme as some of the key elements and placements of features are inspired from the social site. Most interestingly, the theme is easy to customize, so you can add or minus the number of columns and widgets that you’d like to see on the website. Furthermore, there’s a set of custom widgets built in as well. You can make all the changes with the help of the WordPress customizer on the Options page. 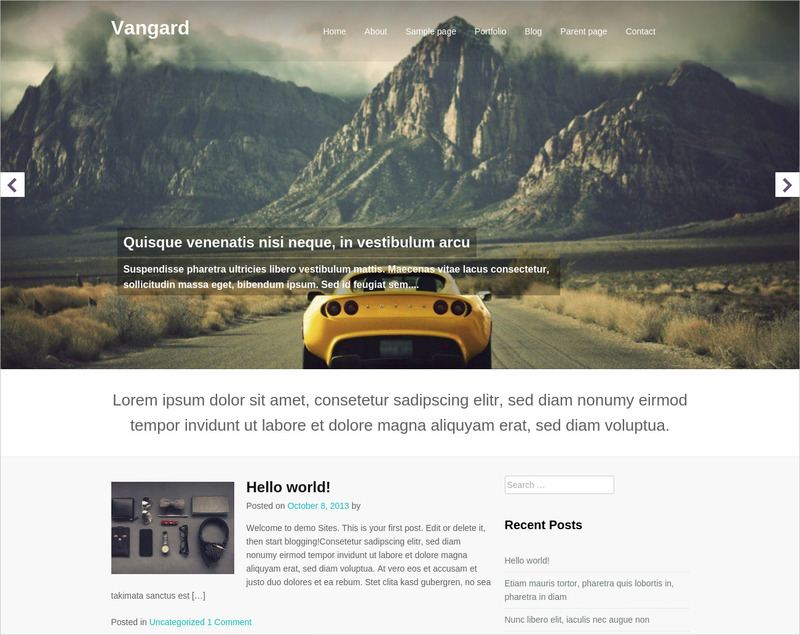 This is a great Bootstrap based Lading Page WordPress theme. With the help of the drag and drop menu manager you will be able to set up the website in no time. What’s more, the list of features includes: theme options panel, drag and drop homepage builder, 2 custom post types, Font Awesome 4.3.0, pricing table short codes, 100 percent responsive design, and a host of other awesome Bootstrap specialties. Need we add: that this theme is stocked with great functionality and cross-browser features? We think not, because it’s Bootstrap we’re talking about here, so many things are a given! 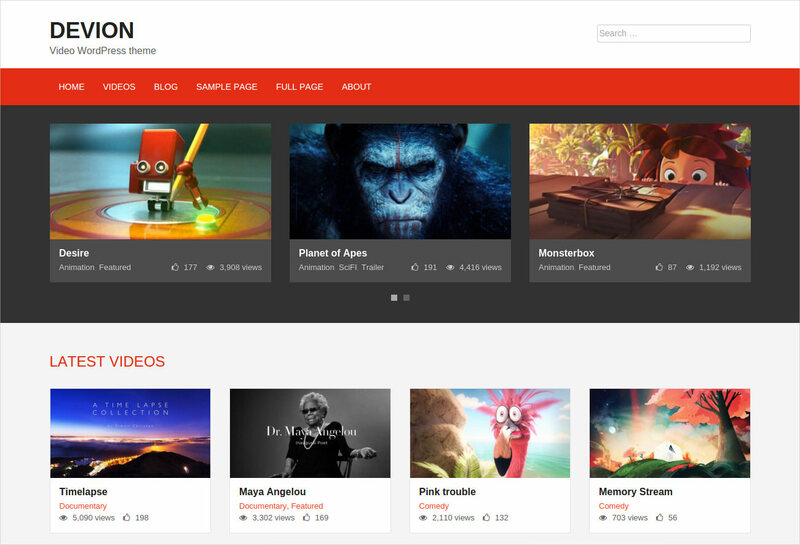 This theme is called as the Devion, and it is a video sharing WordPress theme. 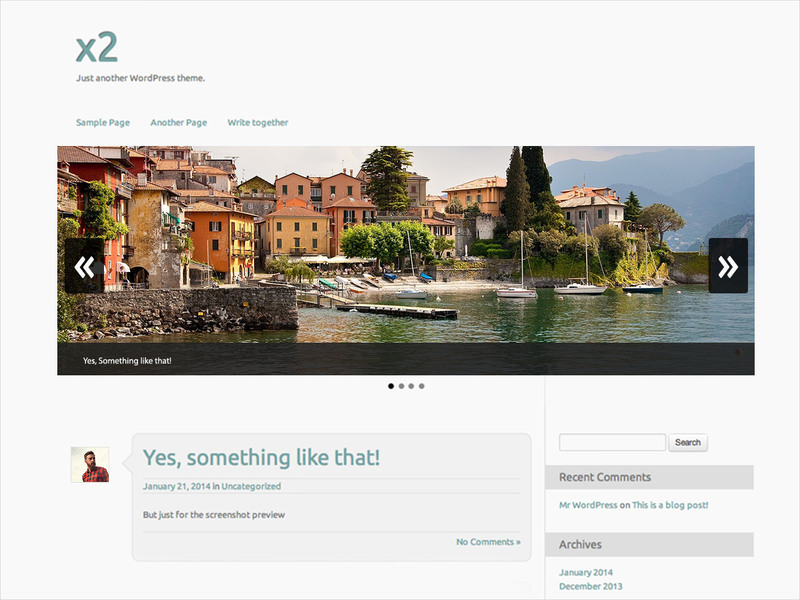 It is a responsive theme designed on Bootstrap 3 framework. If you’re looking for a theme that supports you in putting up video content on your site, this theme is ideal in more ways than one. Thanks to all the goods this theme is stacked up with, the user can easily set in videos from popular video sites such as YouTube, Vimeo and the kind. Plus a user can also upload and publish your own video content. Additionally the theme also has carousal which lines up featured videos, Latest videos and latest posts. 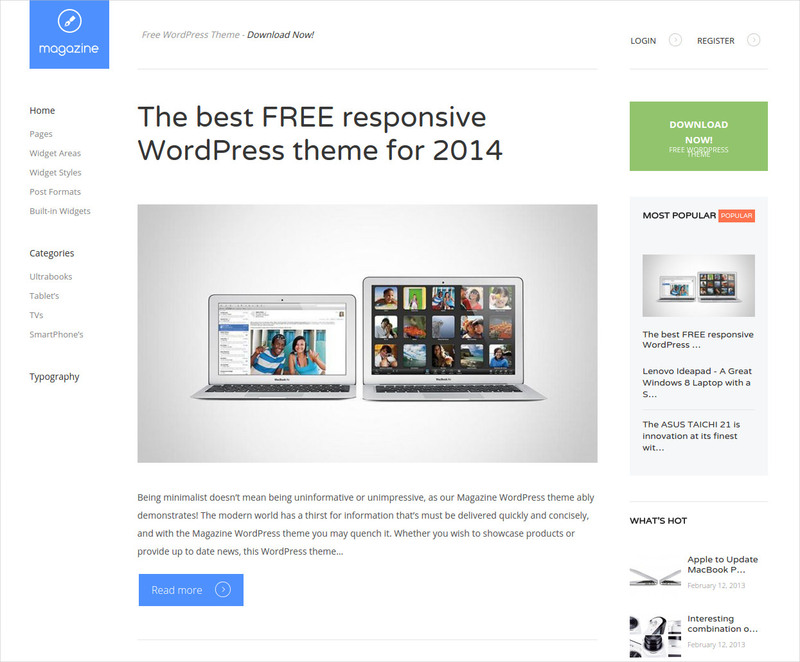 This theme is a feature-loaded bonanza: fully responsive, user-friendly, Parallax theme that is SEO-friendly. It is also Woocommerce ready, and the design is multi-purpose so it can be used by professionals and freelancers from all walks of life. Among other key features you get a full width front page slider, 600 icons. The design is gorgeous masonry grid. The color options are numerous, left and right sidebars, 6 widget areas, primary and footer menus, mobile-friendly and social-site compatible. Of course, the theme bills on easy customization, has high functionality and other key features’ existence is already a given. 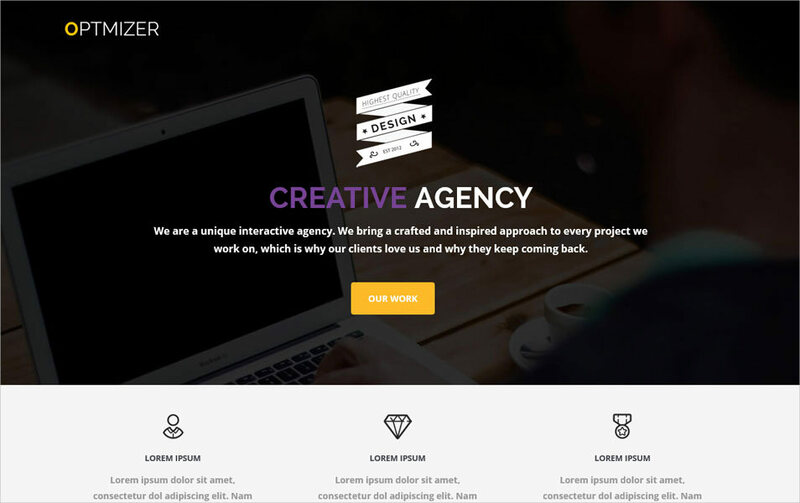 Showcase the best of your works and projects by employing this particular Portfolio WordPress theme. Whichever professional discipline you be associated with, this theme lets you put your best work forward to make an impression in the hearts and minds of your existing clients and potential customers. 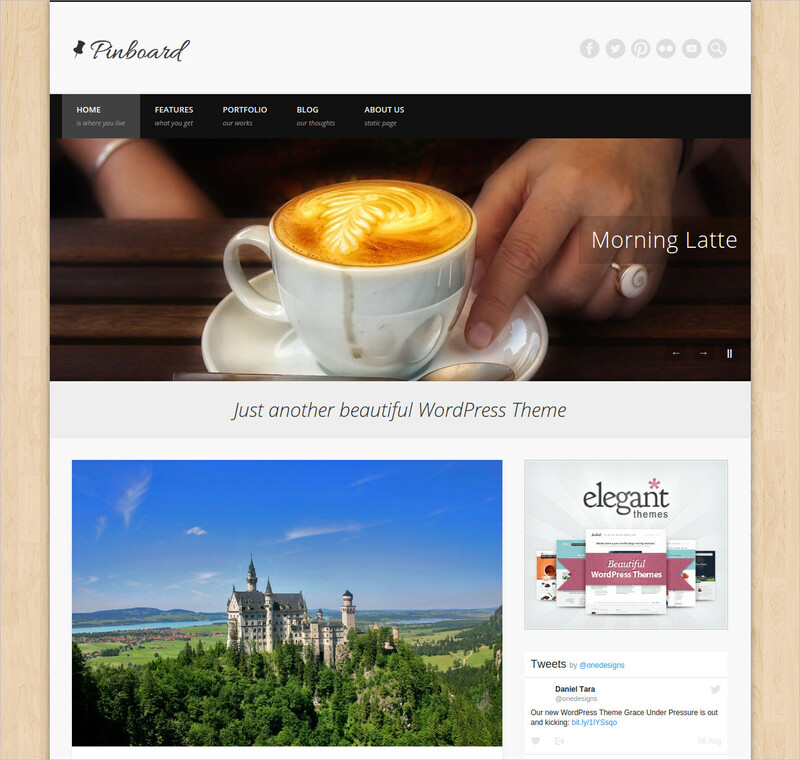 This is a top of the line WordPress theme with A-grade features and tools. You’re going to have a great time working this theme in your website. It will instantly become a wow website. Of course, you can enforce customizations of your choice because it’s a great setup and is armed with best tools and technologies in the market! Here’s one more excellent WordPress theme which could prove to be most useful to you in order to set up or improve your online presence. 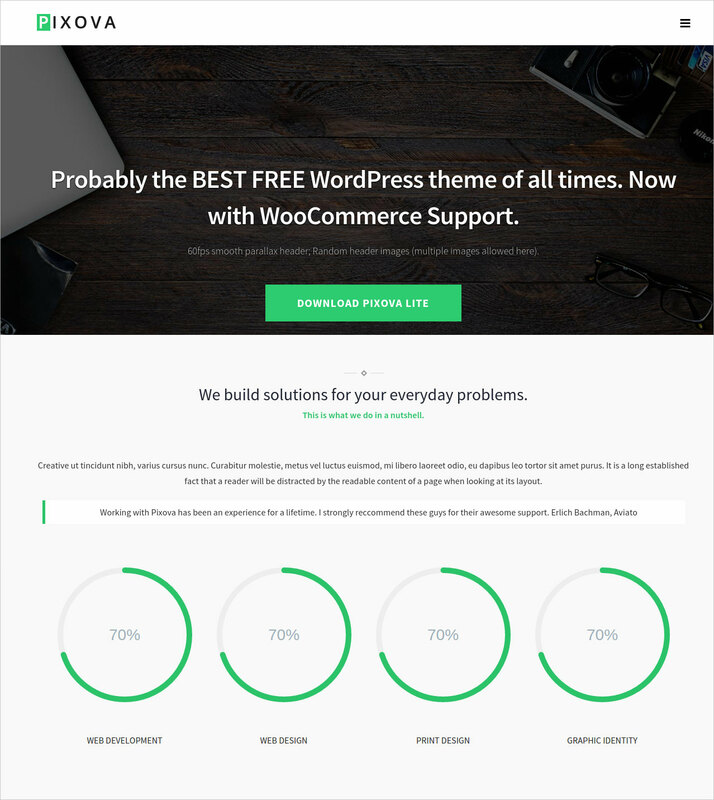 The WordPress them is stocked with the latest of the best widgets, plug ins, short cords and other best tools and technologies which play a part in making a website up to the market standards of the day. The theme is mighty easy to customize, that even a rookie is going to have a field day working with all of the features and elements. Let’s just say, every assured, you’re going to love the outcome! When you think of taking a magazine or newspaper online, one of the biggest worries is that the website design and layout should be such that it blows the minds of the readers, and more importantly sits well with the theme of the newspaper or magazine just as well. We’d vote for this particular Responsive Magazine Style WordPress Theme. It’s got a modern design and layout and more importantly the theme is easy to customize, so you can have all of your favorite things and features lined up on website, without any pressing efforts at all. Compatibility and functionality are another few more of the high points. If you’re looking to establish or improve your online value and visibility then a website is going to be the must-have of course. Whether it’s your first time design, or a redesign, you’d need a website design which is as exquisite as the food that you dish out in your café, bar, pub, or restaurant. Well, this particular theme fits the bill just about right! It looks delicious, and would look even better after you upload the content – pictures, articles, videos etc. The theme isn’t very packed up with features and tools, the ingredients as just as many as the recipe requires! Ramped up with an enviable collection of layouts, designs and colors – which is unlimited actually – this particular theme is basically a bliss theme for anyone of you who wants put up his work portfolio online in the most captivating way possible. You can easily incorporate other multimedia to showcase your portfolio. The design of the theme is modern the color schemes, elements, tools – all of them combine to give viewers’ an engaging website experience – and did we also say that with this theme, the viewers are going to love your works a bit more? The layouts are 100 percent responsive. 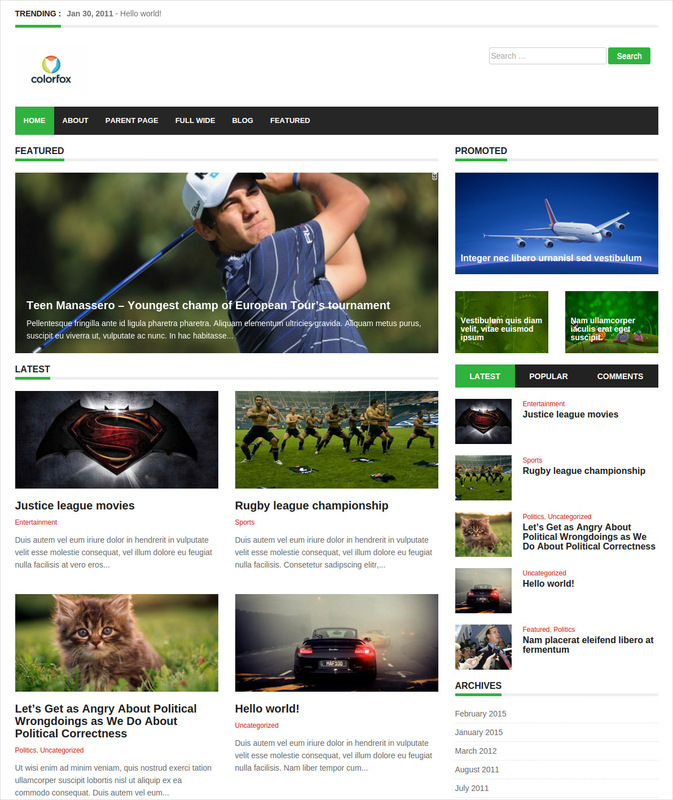 This theme is an absolute for anybody who wants to build a website – purpose and genre irrespective. Let’s just get down to telling you what goodies you will find in this treasure of a WordPress theme – a 2-site layout, full-width and full-boxed, there’s an image wherein you can display the latest of whatever content and pictures which you upload on the site. There’s a bagful of customizations, and a big packet of 600+ fonts, exemplary theme options, 100 percent responsiveness, cross-browser compatibility, high on functionality, mobile-optimized, retina-ready, It is also translation ready, has a Woocommerce built in, in case you want to open an online store. 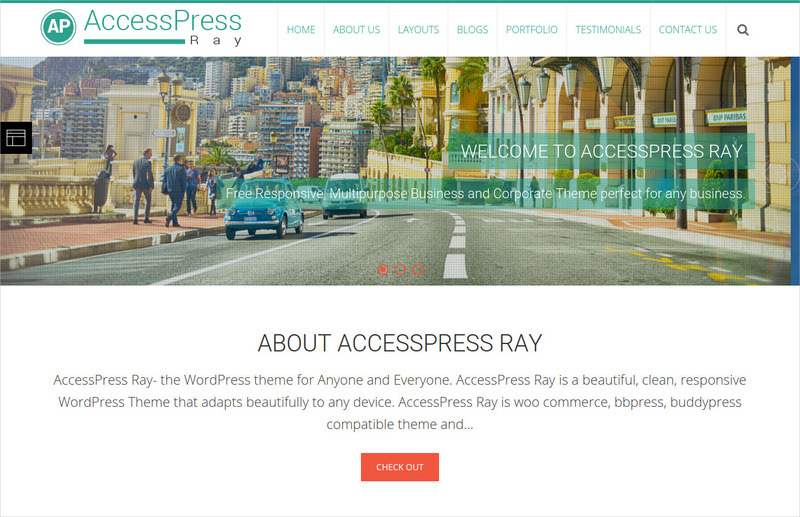 Here’s another premium and feature-rich WordPress theme which has perfection written all over it. 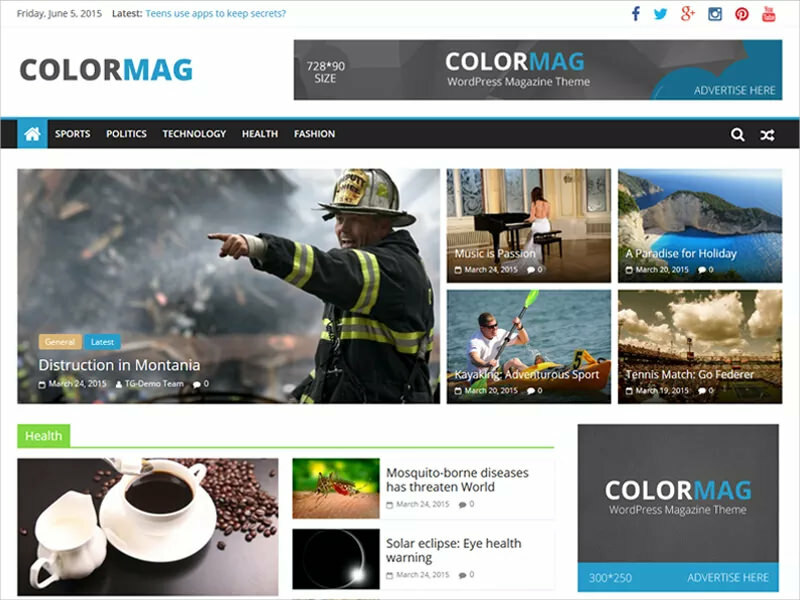 If you’re looking for an online representation for your magazine or newspaper, then this particular WordPress theme is brimming with top of the line features which are best in the market, and will undoubtedly up and boost the appearance and performance. An inset sidebar is one of the heroes of this theme, using it visitors can dive in right into the content, and the layouts are customizable. You can play with the sidebar and position it accordingly or disable it entirely! You have total posts-control too! This is a great multipurpose theme, fully responsive and coded with all the awesome goodies which make it a hot new rage in the world of Multipurpose WordPress themes. Whether it’s business or personal, this WP theme will help you build a modern website with all the options, features lined up for you to try and then work with into your website. The theme is packed with It has 4 page layouts, 2 page templates, 4 blog display types, 13 widgets areas, 5 custom widgets focusing on business templates, slider, and lots more. Try this new avatar today! 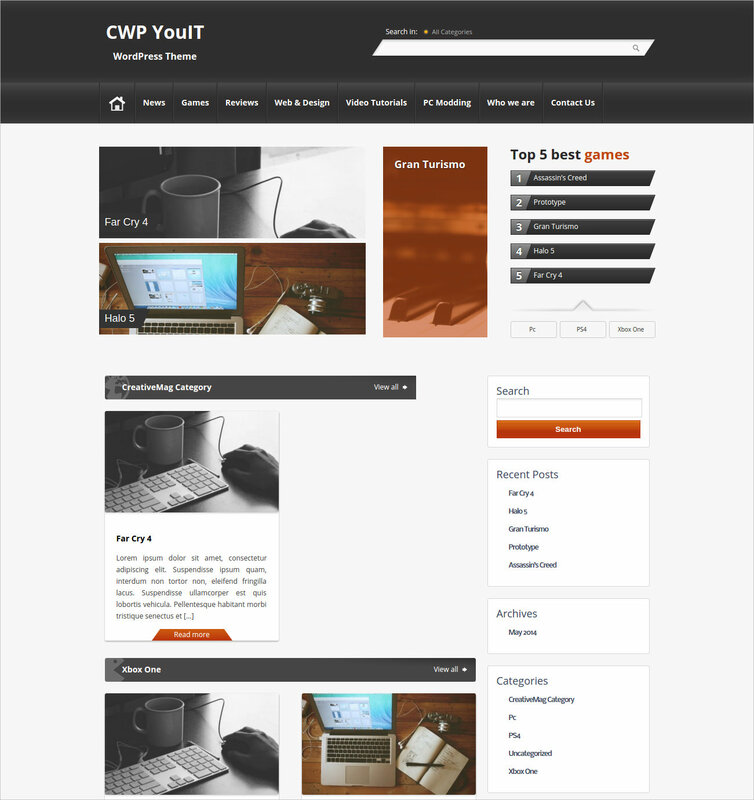 This lightweight WP theme is equipped with a GavernWP framework. Whether it’s a professional website or a personal blog, this theme is suited up with all of the necessary and useful features to entertain all of your website needs. Most importantly, its very easy to customize, lets you go through the assortment of options and then you can pick and choose the option, design, layout which works best for you. 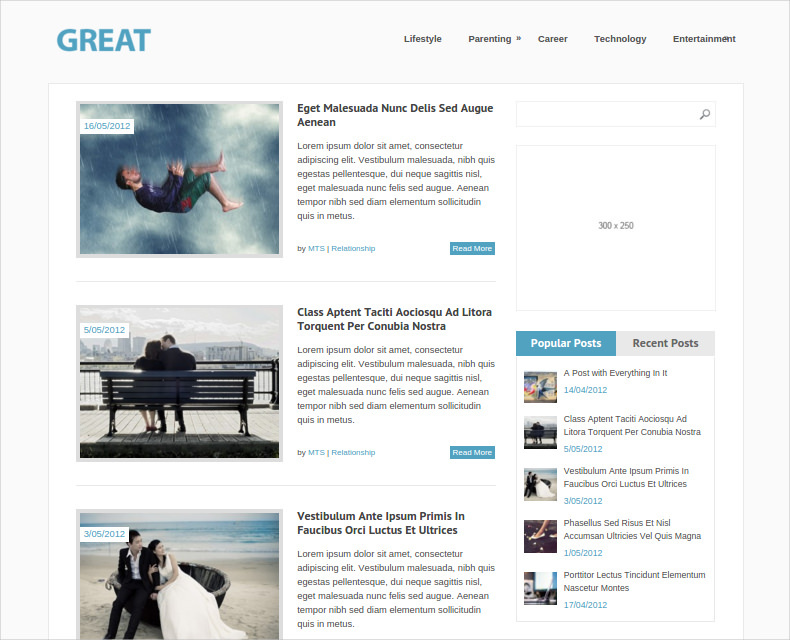 With a free set of the most awesome plug ins, theme will make your site perform better and respond faster. Spread your content faster with the help of the social widgets and more! Check out this all-interesting and very user-friendly Responsive WordPress theme which can effectively become the backdrop for your current or upcoming website – be it a professional site or for a personal blog. The best parts of course are: the theme is retina-ready, fully responsive, there’s theme documentation, advanced layout options which can be explored when you sit down to customize the theme to suit the genre and look of your website. What’s more, if you have a more traffic of foreigners, the theme is already multilingual-supported translation ready and has a great inbuilt social integration. 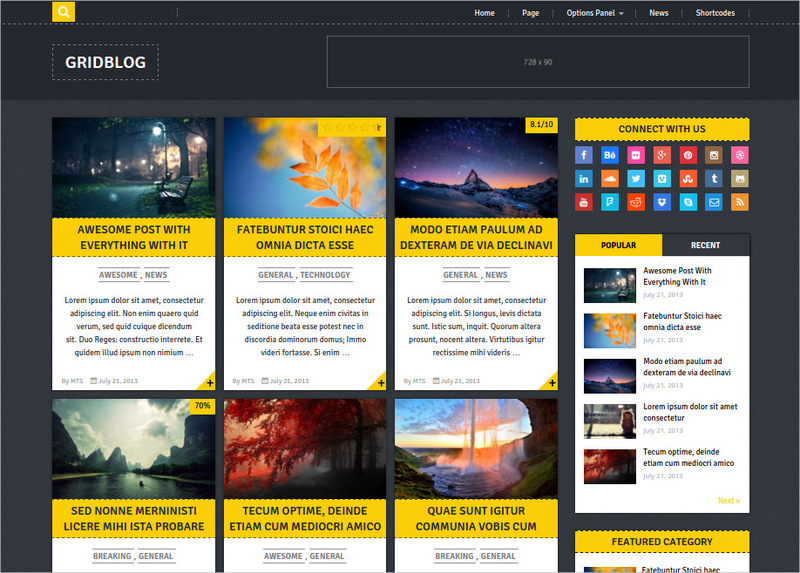 If you’re big about blogging and want to an interesting blogging theme for you blog, then this WordPress theme has all the necessary tools and tricks to up the look and functionality of your blog. This theme is 100 percent customizable and very easy to customize – so if you’re new at this, don’t worry. It has a boxed and full width configuration, header configuration, boasts of 3 different layout designs, grid views, slider, widgets, different footer settings, custom tools, cross-browser compatibility, SEO-optimized, Email support etc. With all this and so much more in the offing, this theme deserves a shot! 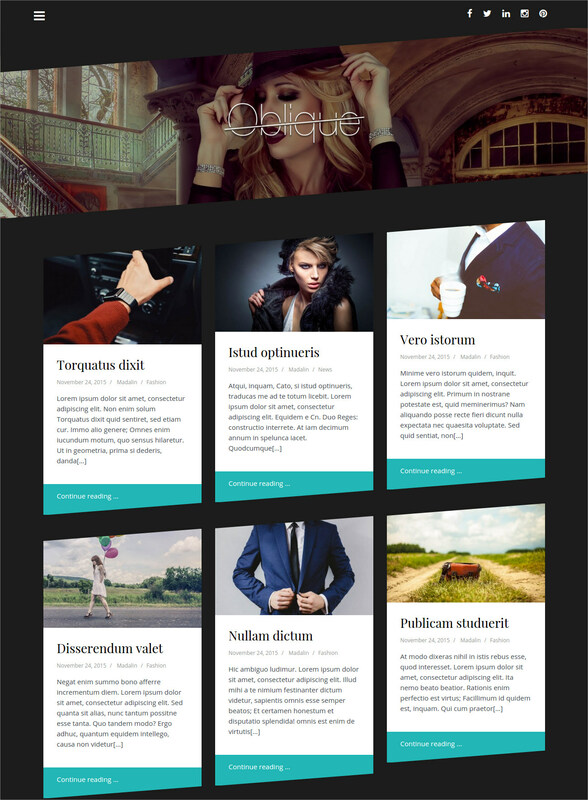 This is a great grid theme which you can employ on your website. It’s got a modern look and feel, and is at par with the best in terms of design. It’s an easy to customize theme, possesses a wide range of great features and tools which will play into upping the performance of your site. As it’s got a grid-based design, that’s the USP of this one. Not just great to look at, it’s high on the functionality and compatibility as well. And not to forget, the theme has 100 percent responsiveness and operates with the best of plug-ins. Magazine-Style WordPress Theme: Check out this magazine-styled WordPress theme which is a bestseller on the online space off late. It’s got unlimited color schemes and you can spruce it up with multiple layout options – lots of choices, as you can tell already. Moreover, it’s got the best of everything: 100 percent responsiveness, custom widgets, great plug ins, there’s a column which displays related posts so to increase readership and page views. If you’re looking for SEO-optimization, you’ll get that in this theme! Reach out to a wider audience as it is translation ready and what’s great is you can customize the theme with background image of your choice! The choice of these themes depend upon the type and nature of the website which is been designed by the designer. A commercial website theme required to be more interactive as compared to other informative websites which can a bit on the static side. If you have ambitions to put up a fun fashion store online, but don’t know the ABC of Web design, don’t worry. 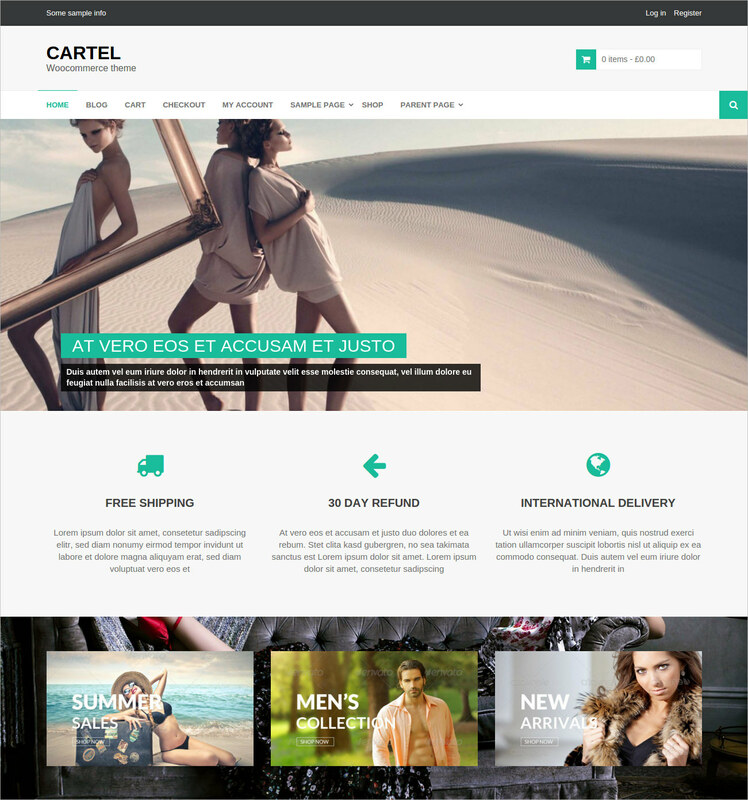 This particular WordPress Fashion Store Theme has a stock full of the best designed tools that will help create the fashion website of your dreams. 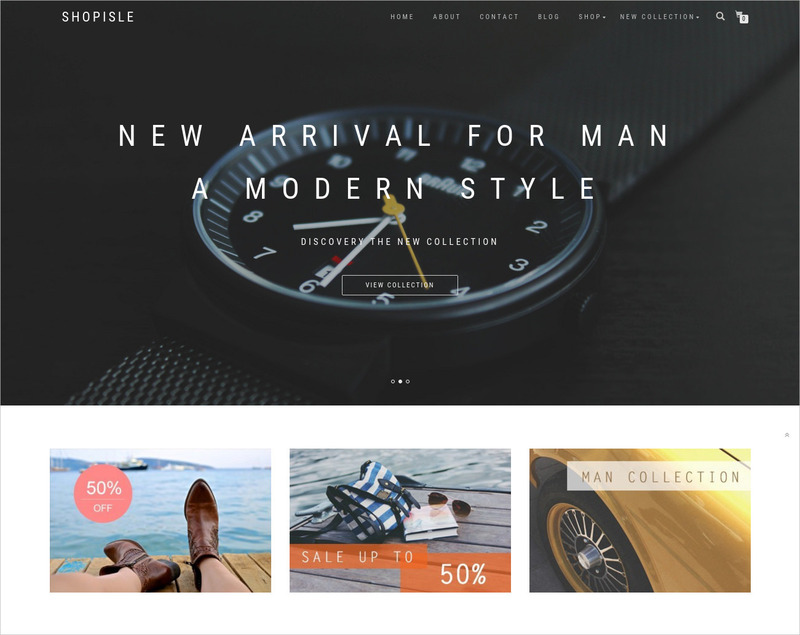 This theme has fully built on customizer, a great Woocommerce design, and deep integration. Also, the theme has a wonderful product listing and checkout page. By default the color scheme is dark pink and white – which is every very fashionable and every girl’s favorite, by the way. It’s also cross-browser compatible and SEO-friendly. If you’re a photographer and looking to set up an online presence, then there is good news as there is a large collection of some very amazing Photography WordPress themes which would leave you impressed for sure. 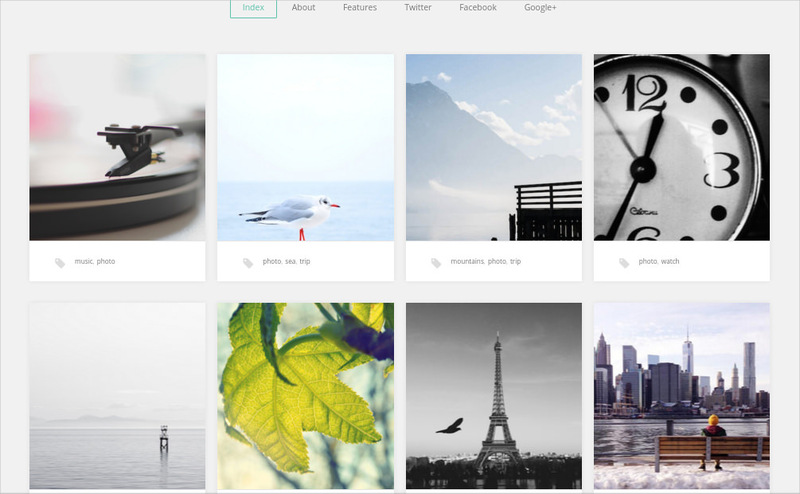 The themes are super-stylish and very photogenic, just like your collection of photographs. The themes are equipped with extraordinary design, modern layouts, functionality and compatibility features, not to forget the themes are 100 percent responsive. You can showcase your works in different ways. 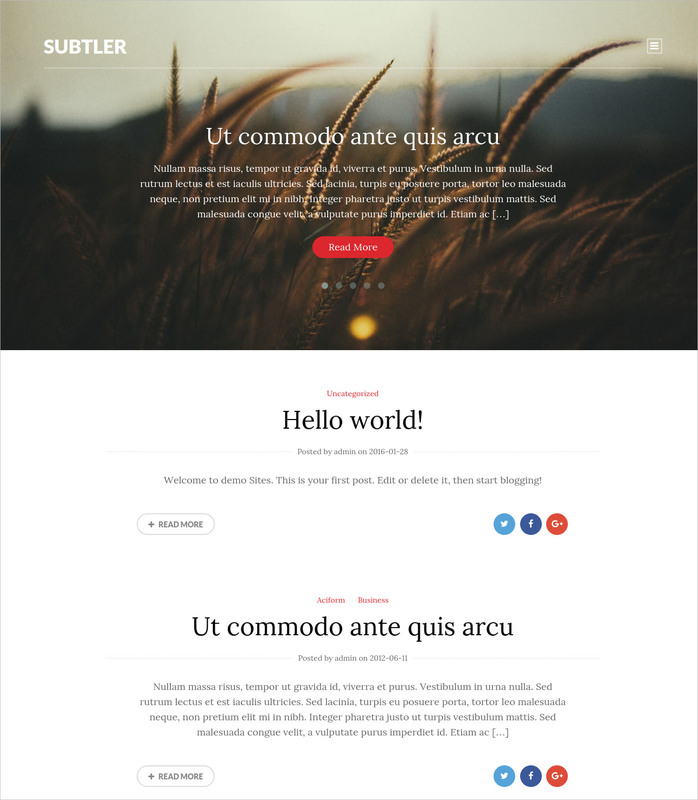 The front page of the theme features a panel of buttons, as well as you can put out your introduction in the same page. This is a beautiful WordPress theme which has Parallax design – the latest trend which has caught the imagination of web design and developers. The design is such that it is armed with 3D effects, which enhances the view and viewing of the website very significantly. Due to this particular feature and a myriad of other features, the overall look and appearance of the website becomes visually engaging and keeps the viewers hooked – which exactly what a website is supposed to do. This theme accomplishes all of that very effectively. And because this theme is high on the interactive aspect, all of the other features work just as well. This feature-rich theme is one of the best results which you will find on the Web when you set out to search for the best business themes which are making headlines in the design world It would be an understatement to say that this WordPress theme is just too good for your existing or upcoming business website. The design is very user-friendly, modern and mighty creatively put together. With a single all-powerful customizer too, this theme is easy to customize and you spruce up the appearance of website by using the multiple header options, page options, footer styles and font styles! Looking to impressive the world with your enviable business prospectus online? 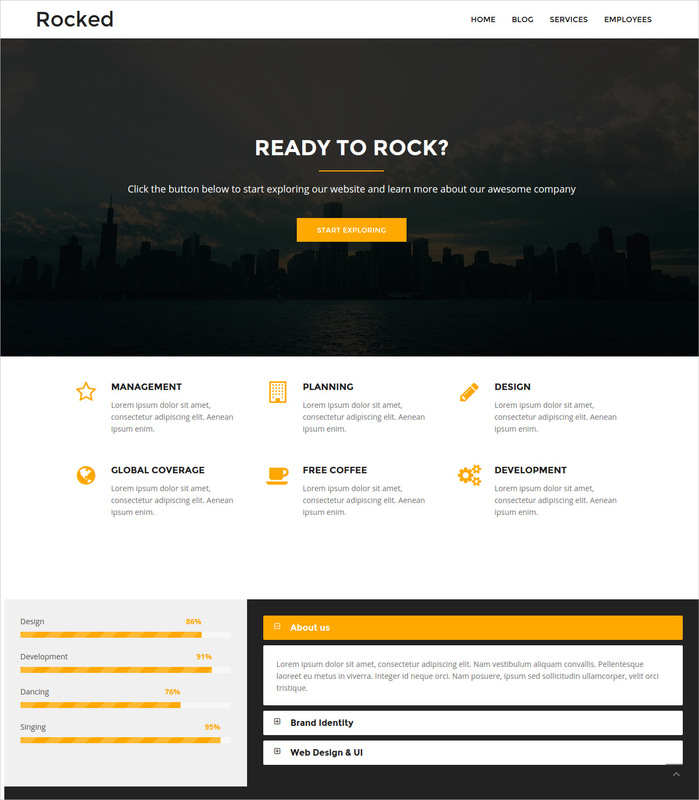 Well, there cannot be a better WordPress theme than this one to let you flaunt your corporate identity. This theme is stock of minimal and only useful features. It’s a multipurpose theme, however, with all of the features it boasts of, a business website with this theme would look most apt. So this theme has a multipurpose design, cross-browser compatibility, the panel allows you to experiment and explore till you’ve found your fitting website look, appearance and usefulness. There are some great sidebar options and social links utility! 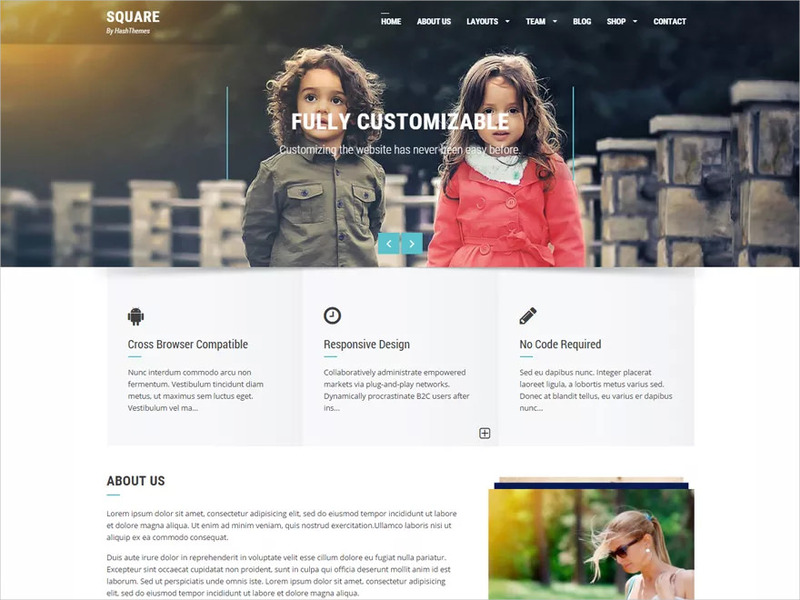 This is an ultra-professional Business WordPress theme which is apt for a business website of any nature. The theme has all the features custom-built, ensuring that you do not invest much time designing the website, and quickly move on to getting the website up, live and running to do business with your clients and customers. This is a multifaceted theme which easily adapts to become the face and body of any website. The usefulness is further extended by the easy customization and high range compatibility features. You can choose your own color scheme – plus and minus the widgets menu as you will. Designing a website for a magazine or newspaper is never the easiest thing to do. But that’s only until the time you’ve got your hands on one such stylish and well-packaged Magazine WordPress theme which is home to all the tools and tricks which can help you develop a website which is spiced up and goes live in no time. With numerous layout variations, infinite colors, exclusive font options, a mixture of recent posts widget styles the theme will help you pull up a professional website in no time at all. All you got to do is upload magazine demo material, and play with the settings a bit so that the site’s look is up to your standards. Here’s an elite WordPress theme which is just right for any business website which would like to flaunt its exclusivity to existing and potential clients. The theme, by the looks of it, is very plush in appearance. It has separate tabs for every important category which you’d expect to see on a business website. You can customize and add or edit as you please of course. Another best is that the theme is 100 percent responsive, so you can relax that your customers would be able to reach you from any device of theirs. There are different sections which have been pre-defined already, but you’re free to make and enforce changes according to your needs. This one is a theme which is best fit for a website wherein you have lots projects and other works to showcase to your clients. It has a simple yet modern layout, a creative design overall. There is a ‘Recent Projects’ sections, where a visitor view all of your works by separately clicking on each of the thumbnail images which represent a certain category or set of your works. All the basic functionality options pre-exist in the theme itself, so you don’t have to spend much time on that aspect. And more importantly, because the website is 100 percent responsive, the site is accessible on any device. This one’s basically a multipurpose theme – you could use it to showcase a portfolio or even set up a website which is corporate in nature. The WordPress theme has a simple design and layout and is loaded with only the needed and useful features, making the site lightweight and easy to navigate. There are 16 widgets to help you get your work done faster and easily. It’s a fully responsive theme and works equally well on browsers. You can take the Theme Options panel to experiment and find the theme design which works for you. There are also sliders, custom-featured posts among other key elements! Here’s one of classy yet very stylishly simple Business WordPress theme that you could use to spruce up your website with. The set of features doesn’t have anything that’s showpiece and unuseful. Each feature is in the theme because it’s useful. Due to this the features set is fairly minimal, thereby up the speed at which you set up the website. It’s a beautiful SEO-friendly theme with just the right modern and creative design. It’s lightweight and very responsive- works on any device, and also boats of cross-browser compatibility so your website can work efficiently on any browser it gets opened in. This theme is pretty much a complete theme deal – ramped up the best of the latest and most useful features and technology which is used to design a website that has the capability to bring in a huge traffic of customers. 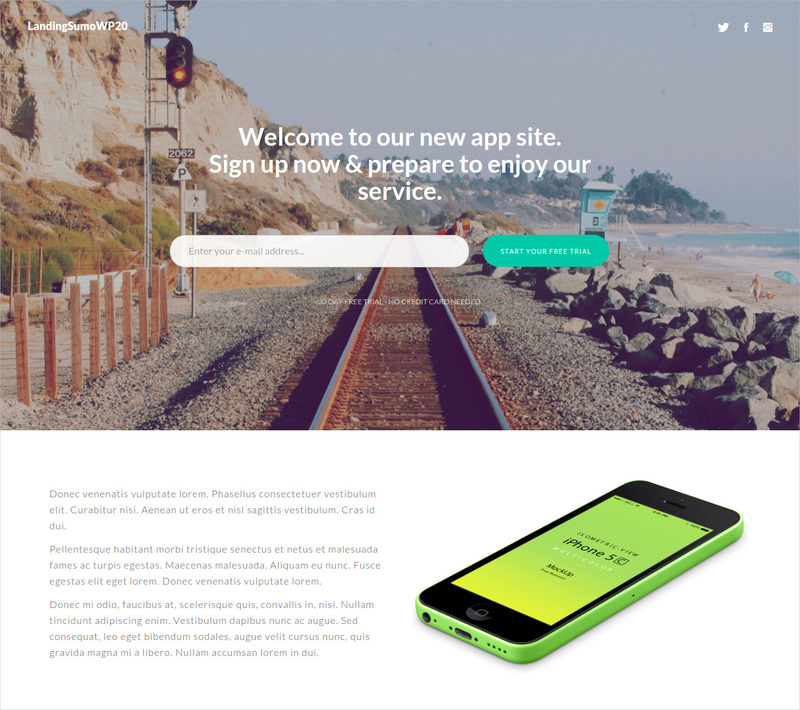 It’s a multipurpose theme – so you could use it for commercial and personal purpose, the theme template is HTML5-powered, fully responsive, and CSS3 animation is useful to add in more excitement in the overall look and design of the website. You can configure the theme quite easily using the theme options panel. There’s a features slider carousel which the latest updates on the website! If you’re in the works to deploy a website for your Sports Magazine than this should be theme that you choose for it. Obviously you can also use this theme for newspaper website, but if we are specifically talking sports magazines and publications, then this theme has got to be your ‘This is it!’ It’s stocked with a host of wonderful features including a fully magazine homepage, YouTube video list, Article page, Responsive ads, and Google Ads, Multiple post and archival layout, Homepage grid view posts, etc. The theme is social media integrated and also has a wonderful reader-feedback section.